Georgina Rodriguez is a Spanish dancer, model, Cristiano Ronaldo's girlfriend and future mother of their fourth child. Georgina was born in the Spanish town of Jaka of the Huesca Province, the mountain resort with the population of 13 thousand people which is situated not far from the Pyrenees National Park. According to some sources, Georgina was born in 1990, according to the others – in 1995. When the girl was four years old, she was sent to the studio of classical dance. After graduating from the school the girl left to Madrid where she continued her dancing classes, at the same time she was working as a seller at the fashionable Gucci boutique. The biography of this little-known, though attractive dancer (the growth of the girl is170 cm, and her weight is 50 kg) could remain unknown if not for the acquaintance of Georgina with the world-class Portuguese football player Cristiano Ronaldo. After the beginning of the love affair with the media personality, Georgina couldn't work quietly at her former place anymore because of the persistence of paparazzi, therefore, she had to leave her job at the boutique. Young people met each other for the first time at Dolce&Gabbana fashion show in the VIP-zone approximately in the middle of 2016. By then the girl had already started her model career, and the forward of the Spanish national team had already broken up with his previous passion - the winner of the beauty contest "Ms. Spain-2014" Desirée Cordero. After the acquaintance, the girl attended one of the games of Real Madrid and she was watching it in the VIP lodge of "Santiago Bernabéu". Together Georgina and Cristiano for the first time appeared in the French Disneyland in September 2016 in the company of the footballer's son Cristiano Jr. who was born in 2010 in the American clinic by the substitute mother for the football player. It was obvious that Ronaldo was hiding his visit from the journalists that were almost everywhere, as he wore dark glasses and a hood. But the pictures of the sportsman and his new girlfriend got at the pages of the "Chi" Italian edition, and then the pictures were published in the Spanish magazine "Hola!". 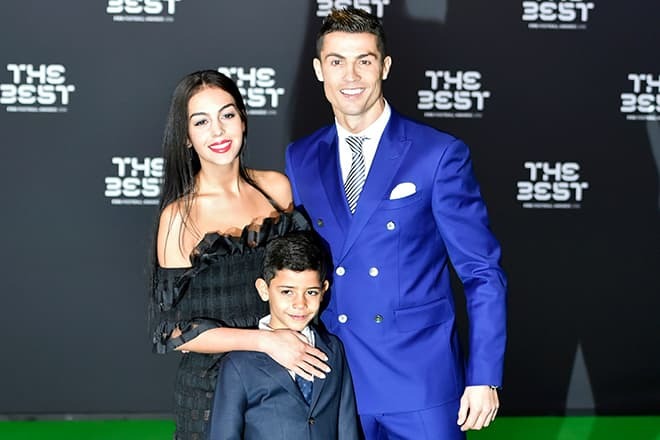 Georgina Rodriguez, Cristiano Ronaldo and Cristiano Jr.
On the 9th of January, 2017 the couple openly appeared together with Cristiano Jr. and Ronaldo's mother at FIFA Football Awards ceremony in Zurich during the awarding to the athlete of his fourth cup "Ballon d'Or". At the numerous photos, you can see that mother of the goal-scorer Maria Dolores is happy with the choice of her son and supports the young girl in every possible way. After the awarding Cristiano and Georgina together moved to the restaurant to celebrate this great event. Such a fast appearance in public with the attractive girl was also caused by the fact that long ago in media there were discussed the rumors about the non-conventional orientation of the forward. In 2015 to the press there came out the information from the TV host of the French talk show "Touche pas a mon sport" Daniel Riolo that Cristiano was engaged in close relations with the Dutch kickboxer of the Moroccan origin Badr Hari. Not to be unsubstantiated, the sportscaster provided proofs in favor of this love affair: there were some joint photos of Badr Hari and Cristiano Ronaldo on which young men were constantly embracing. Besides, the Spanish journalists had carried out the investigation of the private flights of Ronaldo to Morocco for the total amount of $21 million. 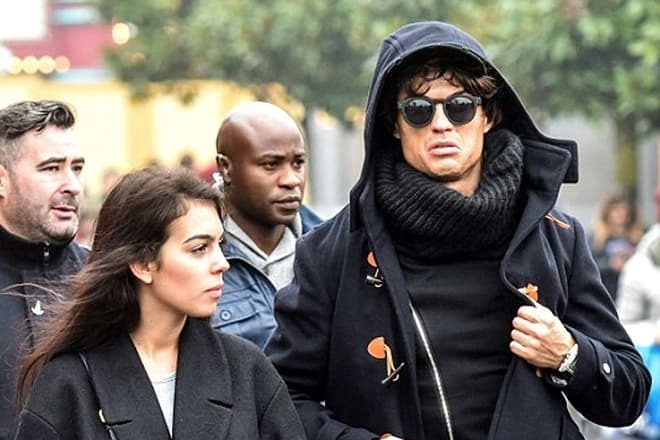 Rumors about the relations of the football player with the kickboxer weren’t even prevented by the facts about his love affairs with the girls: Russian supermodel Irina Shayk, Italian model Alessia Tedeschi, Danish model Maja Darving and a Spanish journalist Lucia Villalon. After the beginning of the relations with the scorer of Real Madrid, Georgina Rodriguez concluded the contract with the "UNO Models" agency and also ordered a professional portfolio at the popular Spanish photographer Javier Lopez. The girl had already managed to post some photos on her own page on Instagram where the number of her subscribers had increased up to 1,2 million from the moment of Georgina’s acquaintance with Cristiano. At present time Georgina Rodriguez regularly attends football matches in which Cristiano takes part. On the 4th of June after the victory of Real Madrid over Juventus in the Champions League, the forward of the Spanish club put on the medal of the winner of the tournament on the neck of his girlfriend. 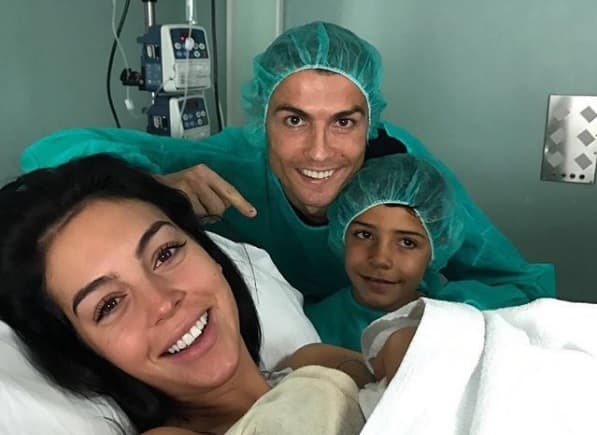 On the 29th of June, 2017 on Ronaldo's page on the Facebook social network there was posted a photo of the sportsman with two newborn twins – brother Mateo and sister Eva for whose birth the football player again resorted to the surrogacy. The children were born when Cristiano was playing for Portuguese national team at the Cup of Confederations in Russia. So that he could see his kids, the coaches of the team allowed the forward not to participate in the tournament for the third place, and a happy father left the competition on the 28th of June. A month earlier the forward of the Spanish Real said that Georgina was pregnant, commenting on the picture of the girl with the rounded tummy. The young people are expecting for their daughter’s birth in the middle of the autumn. Pregnant Georgina appeared together with Ronaldo on Ibiza where she wasn't afraid to take a ride on the scooter with her darling. In November 2017 it became known that Cristiano Ronaldo became a father for the fourth time. Georgina gave birth to the footballer’s daughter Alana-Martina. Cristiano Ronaldo is serious about his relations with Georgina. Young people have set the official registration of their marriage for the middle of 2018. In 15 November 2018 Cristiano and Georgina are engaged.